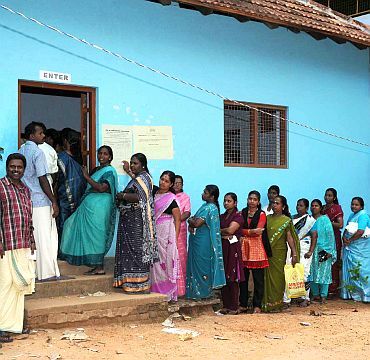 Voters came out in large numbers and were seen queueing up in both urban and rural areas on Wednesday in Kerala where the ruling Communist Party of India-Marxist-led Left Democratic Front and United Democratic Front, headed by the Congress, are locked in a fierce battle. A total of 971 candidates are in the fray, a majority of them independents. The state has a total electorate of 2.31 crore. 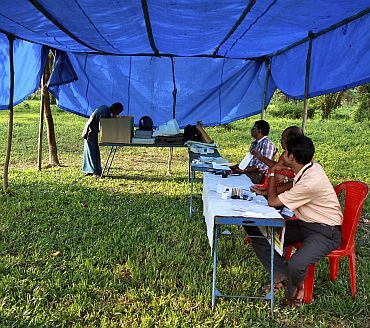 The rival fronts were locked in a fierce combat in most of the constituencies making it a close contest in the state, which had alternately voted for the LDF and UDF every five years and where even a small swing could be decisive. The campaign was somewhat acrimonious with chief minister and 87-year old Marxist leader V S Achuthanandan calling Rahul Gandhi an 'Amul baby' in retaliation to the Congress youth leader taking a potshot at him over his age. In the initial stages, the UDF seemed to have enjoyed a clear edge in view of the impressive performance in the Lok Sabha and civic polls by the Congress and its allies. 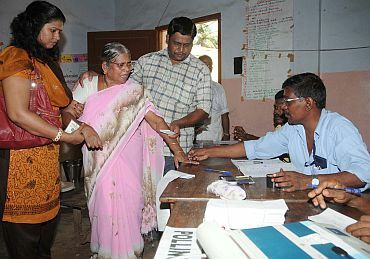 But Achuthanandan's entry into the contest after initially being denied a seat changed the complexion of the battle. As the campaign gained momentum, the ruling LDF has succeeded in taking the fight to the UDF camp. While Achuthanandan has been the LDF's "undisputed" leader and star-campaigner pulling big crowds, Congress veteran and Defence Minister A K Antony was hot on the campaign trail of the Marxist leader to take on his aggressive campaign. The electioneering had reached its crescendo last week with national leaders, including Prime Minister Manmohan Singh, Congress President Sonia Gandhi, AICC General Secretary Rahul and BJP stalwart L K Advani, addressing meetings. All promient Left leaders, including Prakash Karat and A B Bardhan, General Secretaries of CPI-M and CPI respectively, toured the state. High profile contestants included Achuthanandan (Malampuzha), UDF's chief ministerial probable Oomen Chandy (Puthupally), KPCC president Ramesh Chennithala (Harippad), Muslim League leader P K Kunhalikutty (Vengara), Kerala Congress (M) supremo K M Mani (Pala) and senior BJP leader O Rajagopal (Nemom). The electioneering was peaceful with no major violence or cases of serious violation of model code of conduct reported from anywhere.